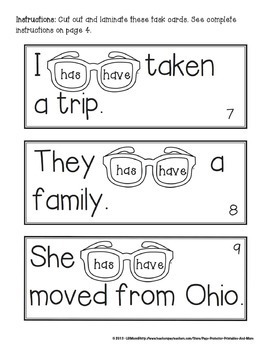 Need to work on the correct usage of linking verbs HAVE, HAS, and HAD with your students? 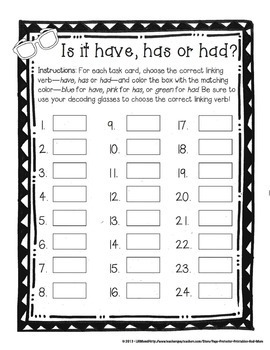 This 20-page resource is designed for center use, individual seat work and/or differentiated settings including speech therapy. 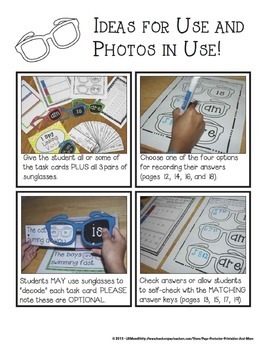 PLEASE download the FREE PREVIEW (button above) to see full-size samples of 3 of the task cards as well as all of the recording sheets and the instructions/example page. PLEASE check out THIS BLOG POST to see a similar product in action! •	Look for the green star near the top of any page within my store and click it to become a follower. You will now receive customized email updates about this store. All Rights Reserved. Purchaser reserves right to make multiple copies for his/her single classroom use only. Distribution in any way, including posting electronically on a website of any kind, are strictly prohibited. Multiple user licenses are available at the time of purchase or anytime after for an additional fee. 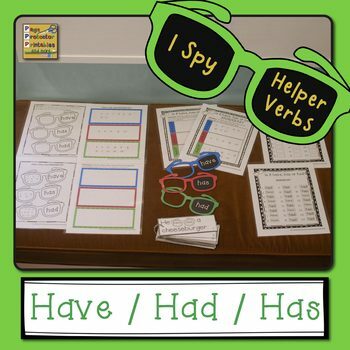 The Helper Verbs BUNDLE includes this resource PLUS two more listed below! SAVE 15% by purchasing the BUNDLE!